Peer to peer technology makes the application entirely decentralized and impossible for any regulator or provider to block it. Mediacoin cryptocurrency is used to ensure content sharing between users. You can obtained it by publishing or sharing digital content within the network. Users can create public channels, make playlists, leave comments and likes. The application does not require that users share their contact details, location information or IP addresses. The network decentralization and files encryption ensures full anonymity for publishing and sharing content. Whom is Mediacoin targeted at? Users will be rewarded with internal tokens for every single file sharing. The reward depends on the size of the file shared. The affiliate program allows you to invite new users of the service, increase the free traffic limit and receive a percentage of the tokens your affiliates earn on an ongoing basis. Our mission is to create a user-friendly decentralized file sharing network free from intrusive ads and hard censorship. To make the data sharing process completely confidential and simplified. Mediacoin offers authors opportunity to make money from their content without using embedded ads and other means of monetization. The platform allows getting a fair reward for users’ interest, unlike the proposals by modern monopolistic advertising systems. Service developers decided to try a groundbreaking idea: to remove any middlemen, enabling consumers and authors to enter into direct interaction and make the content absolutely public and free from censorship. Development of the desktop app design and architecture. Usability testing and data gathering from alpha testers. Full text search function. Files sorted by novelty and popularity. Improvement of the full-text search relevance score. 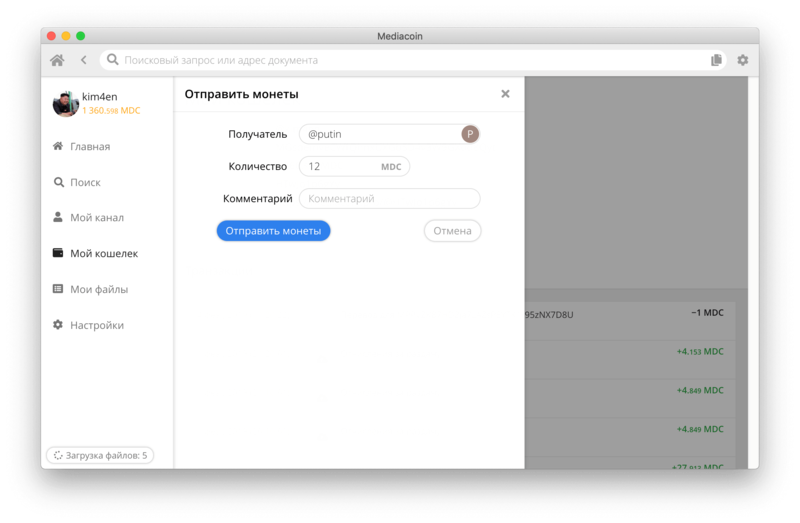 Development of the Mediacoin 2.0 desktop application. Modification of the structure of files and documents storage on the network, access to files from different drives. Closed testing of the client software. Open blockchain node API testing. Release of the open blockchain node API for developers. Development of the client code, a basic cryptography on github. 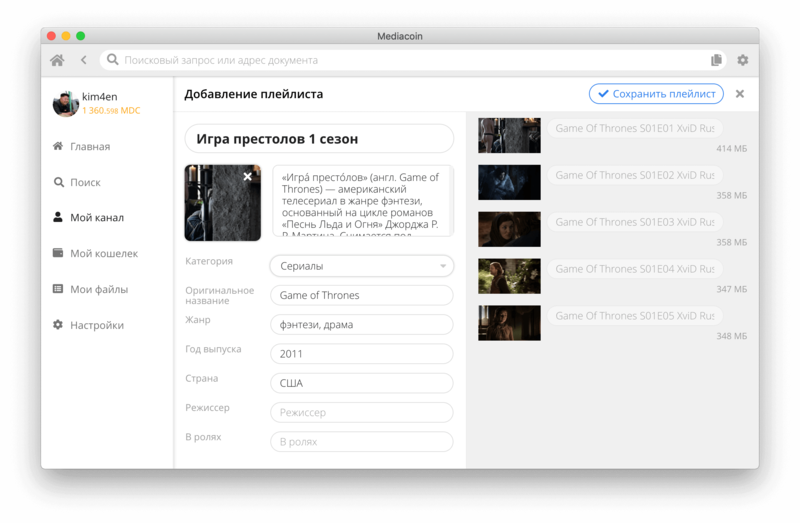 Desktop software enhancement: integration of the torrent protocol, torrent client software, multilingual platform support, language settings for the viewed content. Release of open API for DDS (Distributed Documents Storage) and extended full-node-API. 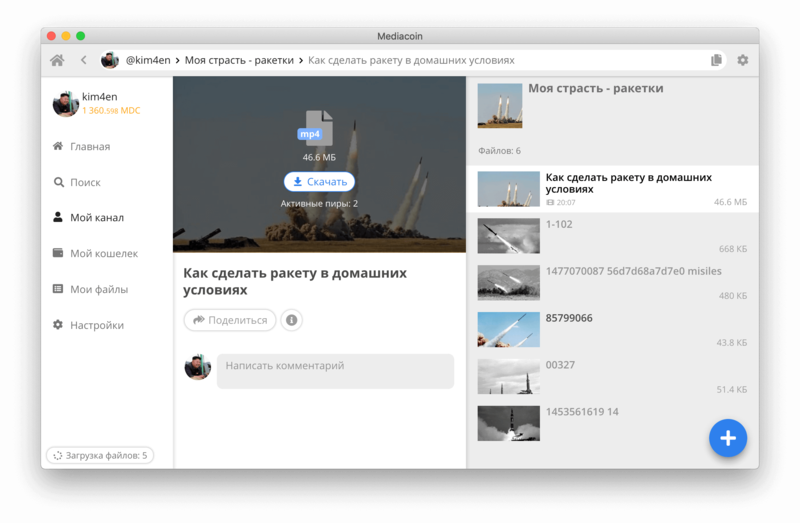 Introduction of personal feeds, blogs and file monitoring functionality. The moderation system based on user ratings “Make a complaint”. 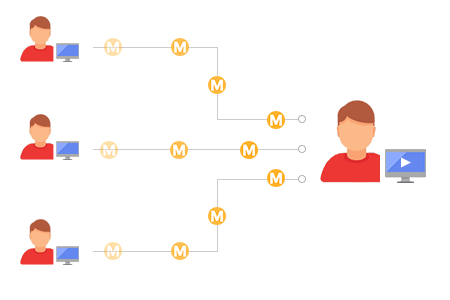 Internal purchase of MDC tokens for fiat/electronic money. + How does the network ensure privacy? All published content is hosted on users’ machines. It is not subject to censorship and is completely anonymous. The network does not have any central nodes, so it can be blocked neither by a provider nor by any other regulator. + Why do I need the cryptocurrency? 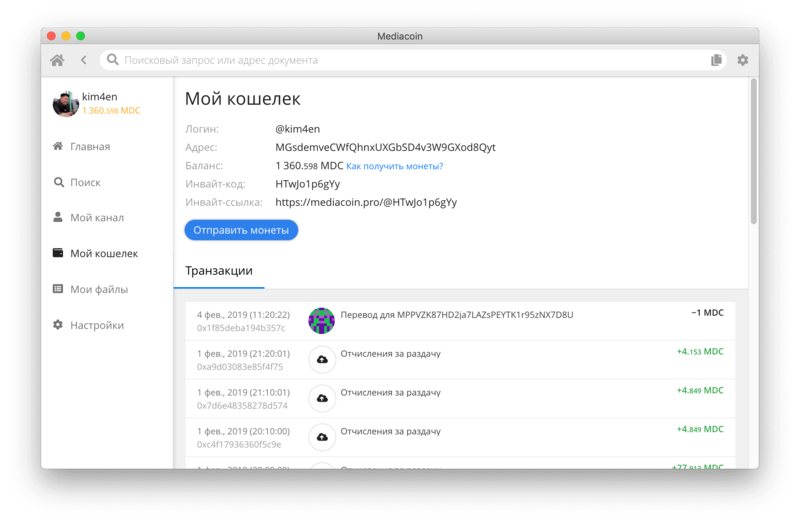 A special internal cryptocurrency, Mediacoin (MDC), has been introduced to keep a balance between those who download content and those who share it. Participants share content in exchange for virtual money. 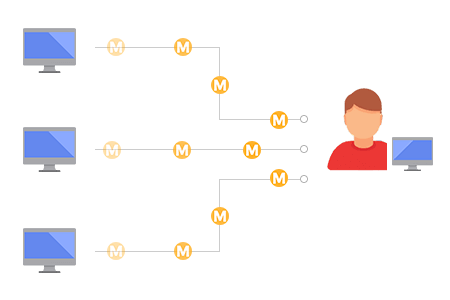 The more content users share, the more MDC tokens they get in his/her account. + What content can I publish? Lack of censorship and peer-to-peer technology allows users to publish any content. Users can give likes/dislikes, leave comments to content. A file rating is based on user ratings. 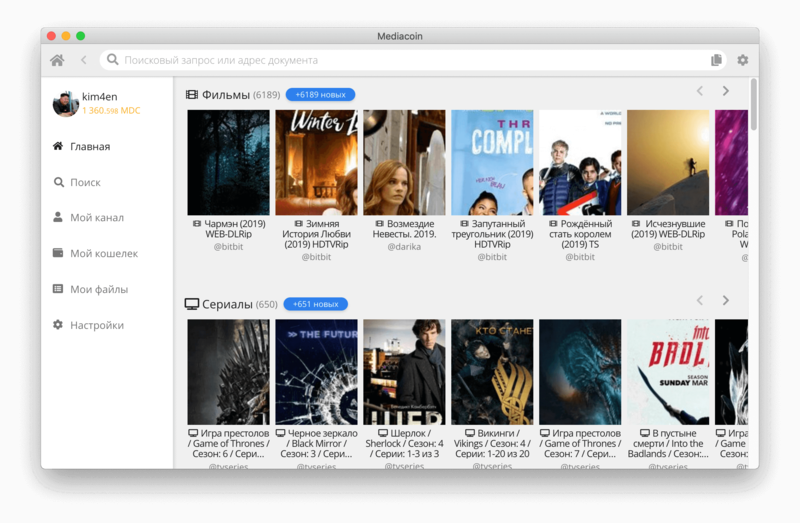 + How does Mediacoin differ from file sharing networks and torrent trackers? Most websites and social networks are profit-oriented. They use content of their members and make users view intrusive advertisements. Mediacoin is a non-commercial project, designed to fairly reward content authors and network users. + How can I earn Mediacoin? 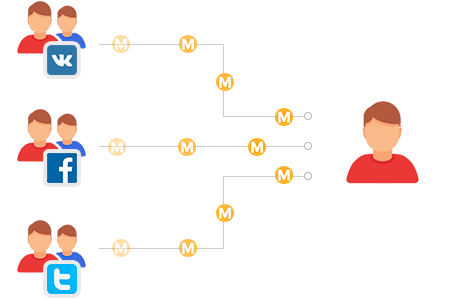 The system rewards members for sharing files, publishing content and attracting new users with the internal digital currency, Mediacoin (MDC). The amount of the reward directly depends on the size of the file: the larger the file you share, the more tokens you receive. + What are the principles of issuing new tokens in the system? 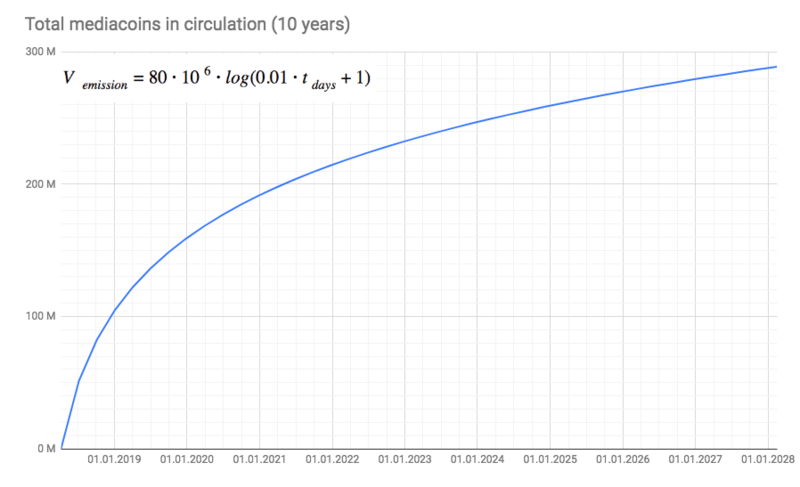 Mediacoin tokens are issued on the time-related basis according to logarithmic dependence. + Can I download content without registration? In order to download a file you need to download the desktop software and set up . a cryptocurrency wallet. Just create a login and password. You are not required to enter any personal data. + What should I do if I forgot my password? The combination of your login and password is actually a private key to access your funds. It is important to remember that the password cannot be changed or restored in the future. + How many tokens will I earn after my file is downloaded? Mediacoin uses Proof-of-Activity and Proof-of-Stake algorithms. The number of tokens to be credited for sharing one GB of traffic varies according to the current total user activity. The relevant amount of the tokens to be credited for 1 GB can be checked in Block Explorer (Average Rate Link!). In addition, the total amount of the reward for file sharing depends partially on the funds available on the peer’s account. + Where can I sell and buy Mediacoin tokens? MDC tokens are scheduled to be listed on other crypto exchanges in Q2 2019. + Why do I not earn tokens? Make sure that the content you publish is interesting to other users. Promote your channel, share links to files and playlists across social networks and resources where they can be of interest. Don’t try to get rewards by fraud. The Mediacoin system does not credit any rewards for fraud.